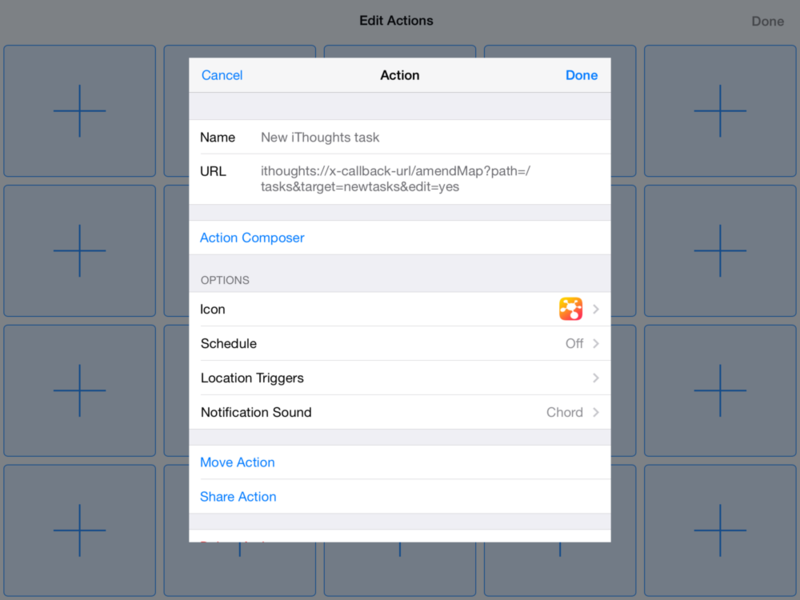 iThoughts can be 'driven' by other apps using a technique called x-callback-url (see here for the techie details.) An x-callback-url is like any other URL in that it provides a way to launch an app and pass it some information. The following video demonstrates how we can create a shortcut that opens a specific map and adds a new topic to an ‘Inbox’ topic. The target map/topic is selected and the required x-callback-url URL is copied to the clipboard. NB: We are not limited to Shortcuts - other apps (Editorial, Drafts, Launch Center Pro etc) can all invoke the iThoughts x-callback-url. The x-callback-url for iThoughts supports a number of options - as below. You can send Markdown/text and have it turned into a new mind map. NB: Assume everything is case sensitive and remember to 'percent encode' the parameters. Below you can see some Markdown text in Editorial which has been selected and the 'Send to iThoughts' workflow tapped. The workflow sends the text over into iThoughts to be converted into a map. Notice how (in addition to the text) the path to the map and the style settings are passed as parameters. It is also possible to amend an existing map. This requires the original app to supply a path to an existing map and a 'target' to identify where (under which topic) the amendment should apply. A good use for this is to create a shortcut in 'Launch Center Pro' to add a new topic to a '/tasks' map under the 'newtasks' topic. Notice how (in the following example) we don't even pass in any text - thus we get a new blank topic.